Alien: Covenant Has a New Xenomorph Monster Created by David? Last week, 20th Century Fox confirmed that director Ridley Scott's Prometheus sequel is called Alien: Covenant. It will tie into the overall Alien movie universe, and is considered the second chapter in a prequel trilogy. In the film, the crew of the colony ship Covenant is bound for a remote planet on the far side of the galaxy. There, they discover what they think is an uncharted paradise. But it is actually a dark, dangerous world whose sole inhabitant is the "synthetic" David (Michael Fassbender), survivor of the doomed Prometheus expedition. Today, Scified has new insight into this plot, and their sources claim that two xenomorph aliens will be wrecking havoc in the movie. And yes, David, playing God, has a hand in creating one of them. None of this information has been confirmed by the studio or Ridley Scott. So it's only being considered a rumor for now. But Scified think this information has an 80% accuracy rate based on what they've seen and heard as it gets confirmed. They note that some of the story may have changed after John Logan came onto polish the script. But as of this fall, this detailed account of what is happening in the sequel was part of the initial draft that was completed and greenlit. Their source had this to say about the 2 monsters coming our way in October 2017. "The movie will have 2 Monsters, one is new and both are different yet similar to the Xeno DNA. The NEW Monster is a New Event, so it's nothing created before the Events of the end of the First movie.... it's created by an event in the movie... and this New Monster is going to be based off of the Original Concept that Alien drew influence from, and this idea is something they had planned with Spaights' Ultramorph and so Gigers Necomonicon 4 is the starting point. This Monster will be transparent like a Jelly Fish to a degree.... and it's hinted that David plays a part in its creation." The Scified source goes onto claim that this next installment in the Alien saga won't go down the same path as the original Alien movies. But there will be a lot of clues that connect the Xeno DNA and Bio-Mechanics of the Engineers. The themes in the movie will connect to the Prometheus Mythos and the Bible, but more in respect to the Paradise Lost concept and poem. But the Aliens seen in the first movie will not yet be fully formed. The site goes onto explains. "They won't be going a full blown Ancient Aliens in detail on us, just we can make subtle links to themes, such as Rebellion, Order of Creation (that has multiple layers that does not start with the Engineers and does not end with David). Stealing of Forbidden Knowledge and Fire and how playing God and going against God always has dire consequences." 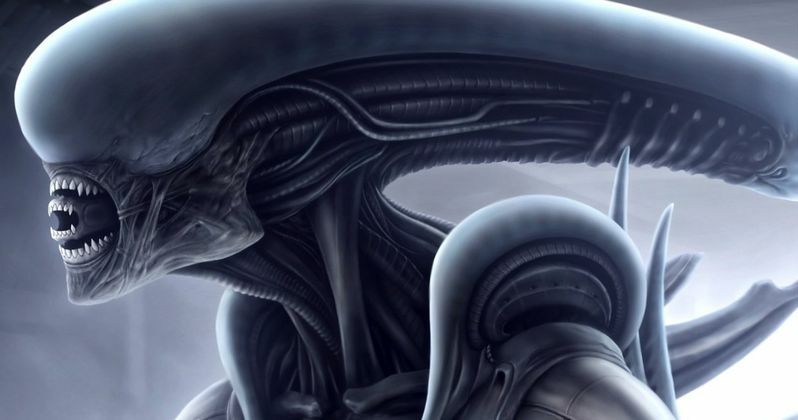 While one Xenomorph creature will be new, the other will be something that we've seen before. This hints that the Deacon may still have a role in this Prometheus follow-up. The new xenomorph is said to be heavily influenced by the Ultramorph in writer Jon Spaihts' original Prometheus script, which was titled Alien: Engineers at the time. In that draft, an Engineer gave birth to an Alien. And because the Engineers are much larger and stronger than humans, so was this beast, who draws its traits from its host. It was an Alien that towers over its human-host counterparts. The concept was scrapped when Prometheus finally went into production, but concept art, which we share below, shows what it would have looked like. Scified claim they have even more story details about Alien: Covenant to share, but won't be doing so until sometime next week. The sequel beings filming in January, 2016. And they suspect that some of what they have on hold will be revealed by the production itself once everything gets underway. What do you think of these latest developments?